Brown Paper Packages: Some Inspiration. . . I have been in a crafty/emotional funk this last week or two. I can't decide if it is because Pattern Makeover Month is over, and I miss it. . . Or maybe it is because it is almost June and we still have not had any spring weather. . . Or maybe it is because K3 moved her bedroom into my sewing room so I can't sew in the evenings. . . Or maybe it has something to do with K1 finishing first grade (how can I have a SECOND GRADER ALREADY?!?!?). . . Or maybe it is a combination of all of the above. It means, I have not accomplished much and my inspiration is running on low. Thank goodness for my online friends! Skirt Week! June 21 - 25, 2010. Enter up to 4 skirts. Categories: kids, straight, full, A-line. Deadline for entry June 18. Adrianna & Susan pick a winner from each category. Enter up to two items that are embellished or trimmed or bedazzled.Fun prizes! . . . . . . . . . . . . . . . . . . . . . . . . . . . . . . . . . . .
1. Find the ugliest knits you can stomach (old sweaters, pjs, sheets, etc).....and create something great from them! Anything goes...clothing, pillows, toys, accessories etc. 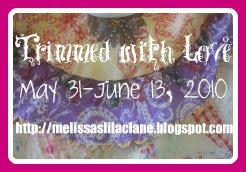 Dyeing, printing, embellishment encouraged. All entries accepted. 2. 50% of your project must be made from the ugly knits. *Prize shipping is limited to the U.S. only, but international entries are welcome! So come join the fun and gain a little inspiration! Thanks for the shout out, Leisel! Can't wait to see what you make! Oh, and I am totally with you on crafty funk. But I place the blame soley on my blog partner who is moving 4000 miles away from me in a few weeks. Yep, totally her fault. Thanks for spreading the word, Leisel. I'm sorry about the funk. My littlest one just moved herself into her big girl room and big girl bed, instead of the nursery. And since she's my last, I'm kind of sad too. And now have an open room that I'm not sure what to do with . . . I look forward to seeing your newly inspired creations. I do so enjoy your work. Also, thanks for the heads up with the contests, definitely inspiring!